Most stop snoring devices clearly state that they are only for adults. This is probably because children still growing should not have a device in their mouth for several hours per night unless recommended by their dentist or sleep specialist. 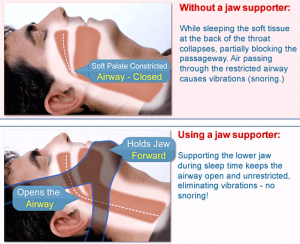 My Snoring Solution does make several references to snoring in children, and that it can lead to attention deficit hyperactivity disorder (ADHD). However, you never want to have a child try any type of sleeping device without consulting a physician. That being said, a snorer in their very late teens who is already considered an adult could benefit from this product. The University of Michigan Health System suggests that children who snore (even babies snore) are twice as likely to be hyperactive and inattentive. This validation offers an intriguing link between attention deficit disorder and poor sleep quality. Children who snore do tend to score lower on language abilities and attention tests. Some suggest that removing adenoids and tonsils in children can result in improved behavior and better sleep. Maybe you are saying you never had attention problems as a child. Well, this doesn’t mean you don’t now. Adult attention deficit hyperactivity disorder can develop at any time, as can snoring. So, you have to wonder, is your snoring causing this condition? Do you actually have this disorder or are you simply experiencing symptoms of snoring that are quite similar? Snoring robs you of your quality sleep, which can result in daytime sleepiness, irritability, and difficulty concentrating and problem solving. These also happen to be signs of ADHD. There are many solutions to help with snoring. Could a product like My Snoring Solution be the answer? Quite possibly! 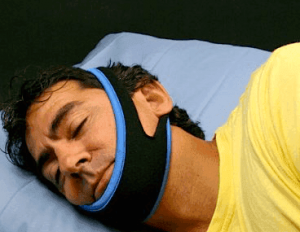 If this stop snoring chinstrap works for you, your body will enjoy higher quality sleep. You will wake up well-rested, which will make it easier to concentrate. I have a few complaints about My Snoring Solution, but overall it’s an interesting product that may be the best solution for some snorers. Another interesting product is one that trains your tongue muscles to alleviate snoring, check it out here.